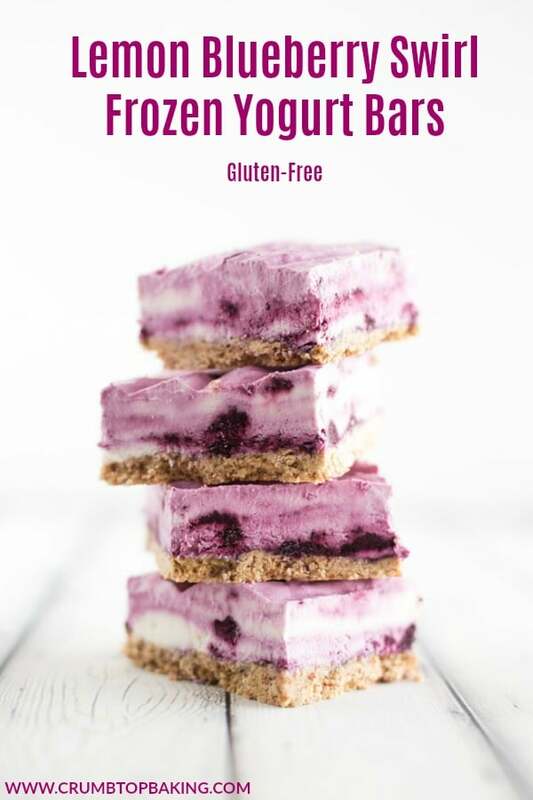 Before summer officially ends, I had to share this recipe for Lemon Blueberry Swirl Frozen Yogurt Bars. We usually get a few warm days in September, and with blueberries in season, these frozen treats are practically essential! 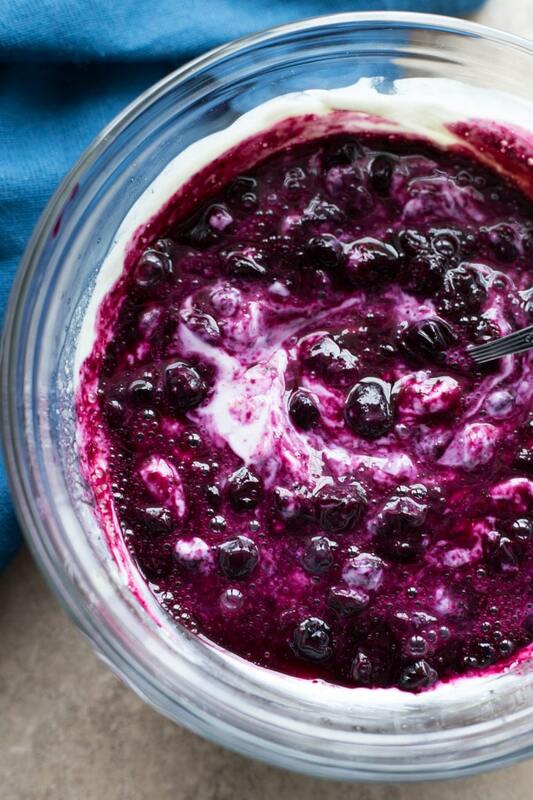 With ingredients like almonds, protein powder, high-protein yogurt, lemon, honey and blueberries, these are so good you could almost eat them for breakfast! How was everyone’s Labour Day weekend? Did you go blueberry picking? Blueberry season is in full swing in Newfoundland, and Labour Day weekend always reminds me of blueberry picking. Not that I go blueberry picking very often, but I’ve been known to do it once or twice. I’m more of the type that accepts blueberry donations from other pickers! Thanks Mom 🙂 . So, with lots of blueberries in our house these days, I’ve been dreaming up all sorts of blueberry recipes. For instance, yesterday I made a large batch of blueberry chia jam. Hopefully it’s enough to get me through the week 😉 . While it’s a simple recipe, it is so good! I’ll be sharing it on Instagram over the next few days, so keep an eye out if you are interested. 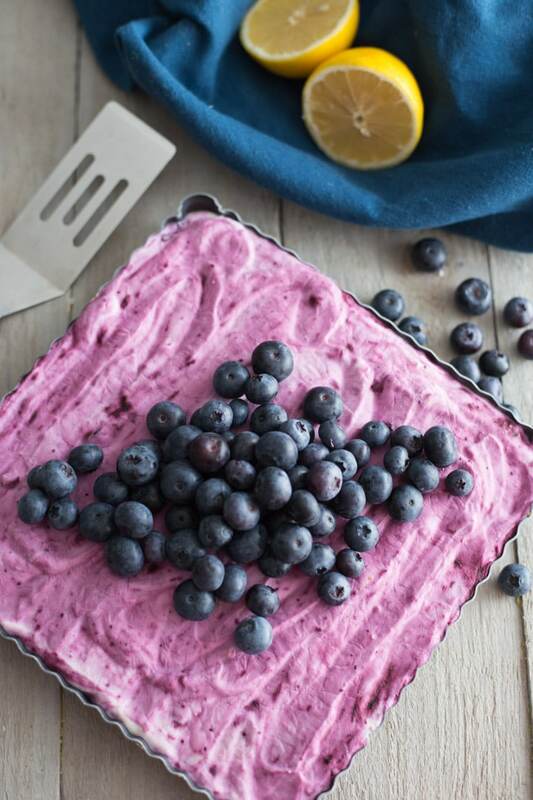 In the meantime, I’ve been making these Lemon Blueberry Swirl Frozen Yogurt Bars on repeat. Not only do they have loads of blueberries and lemon swirled around in them, but they include my new favourite yogurt – Skyr. Have you heard of it? I think I’ve mentioned on the blog already that dairy and I are not always on good terms, especially ice cream and yogurt. (Thankfully, cheese seems to love me. Yay!) I’ve pretty much given up on ice cream, and I even gave up yogurt for a time, but couldn’t really commit to it. Yogurt is just such a convenient, healthy snack, and it’s great for baking, so I’ve been on a mission to find a yogurt that I can have a solid relationship with. Skyr is an Icelandic yogurt that’s super thick and creamy, and high in protein (we are talking 19 grams per serving), which makes it perfect for breakfast or a mid-morning snack. A friend of mine introduced me to it a few months ago and I’ve been eating it ever since. It’s awesome with granola and fruit, but it’s also perfect in these Lemon Blueberry Swirl Frozen Yogurt Bars. You might think that the yogurt would make these bars taste really tart. 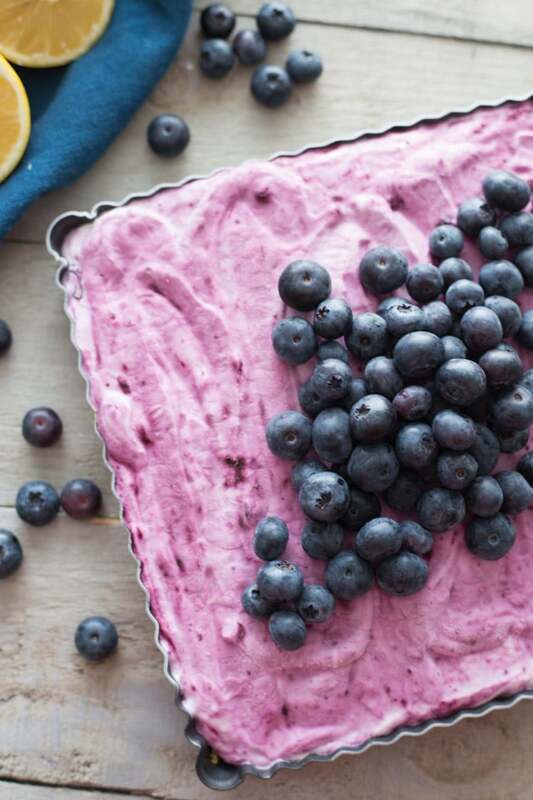 But the lemon, blueberries and vanilla totally balance out the tartness of the yogurt and the vanilla protein powder in the crust also adds a nice contrasting taste and texture. You will also notice that I snuck a little bit of cream cheese in this recipe. Not exactly clean eating, but it’s organic cream cheese, so I think that gives me a bit of a pass! Plus, the cream cheese makes the yogurt extra creamy and it helps prevent the yogurt from getting too icy when it freezes. So that’s it! 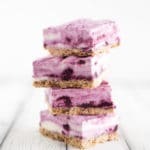 These Lemon Blueberry Swirl Frozen Yogurt Bars are delicious and quick and easy to whip up. They are so good you might even want to go blueberry picking 😉 . If you make these bars, snap a pic and post it to Instagram. 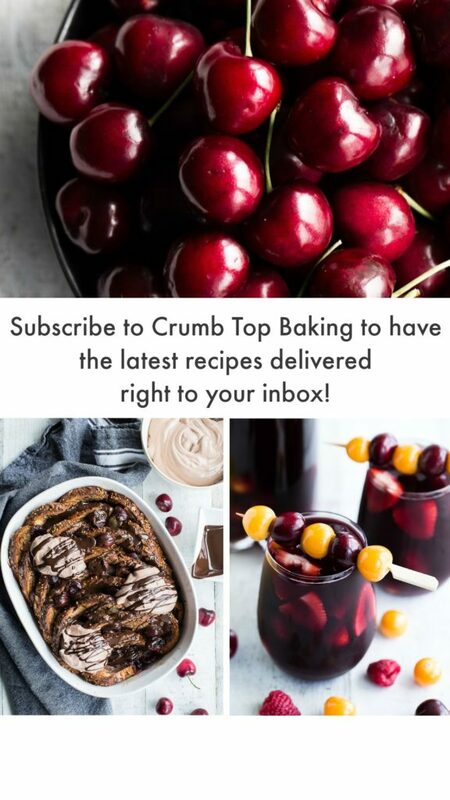 Be sure to tag @crumbtopbaking so I will see it! 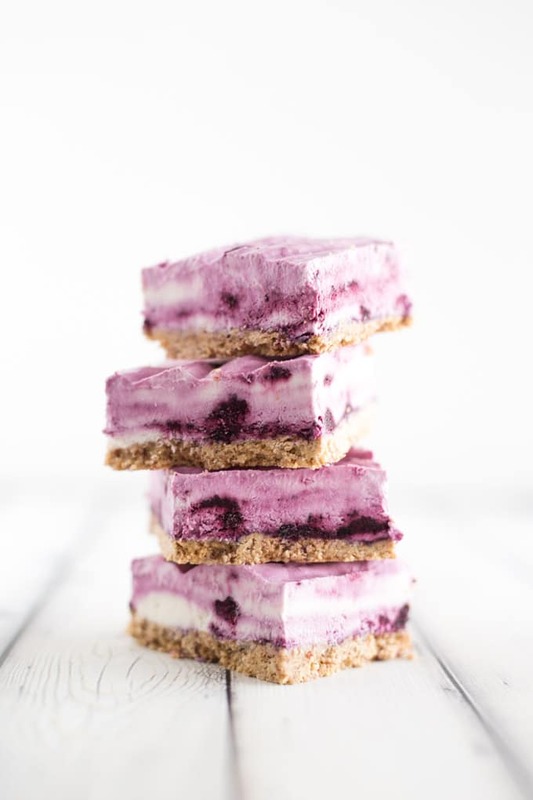 These Lemon Blueberry Swirl Frozen Yogurt Bars are loaded with protein and antioxidants, so feel free to “indulge” in dessert! They are made with almonds, protein powder, high-protein yogurt, organic cream cheese, lemon, honey and blueberries. Packed with so many filling ingredients, you could almost eat them for breakfast! Pre-heat oven to 350 degrees and grease a 8 inch square tart pan. In a small bowl, add the ground almonds, protein powder and coconut oil and stir together until it gets a bit crumbly and sticks together. Press into the bottom of the tart pan and bake for 8-10 minutes. Let cool completely. In a small sauce pan, add the blueberries. Bring to a low boil and simmer until stewed together. In a small bowl, combine the water and tapioca starch and stir until the starch is dissolved. Slowly pour into the blueberry mixture and stir vigorously until well combined and mixture begins to thicken. Let cool. In a medium-sized bowl, add the cream cheese and beat on high until creamy (about 1 minute). Add the yogurt, honey, vanilla, lemon juice and zest and beat on low until combined. Add the blueberry mixture and fold it around a few times with a spoon to create the blueberry swirl. Do not beat in the blueberry mixture. Pour the yogurt/blueberry mixture on top of the crust. Place in freezer for 2-3 hours until almost frozen. Cut into 16 squares. If it fully freezes, just let it sit at room temperature for 5-10 minutes before serving. Store leftovers in the freezer. I use the President’s Choice brand Skyr yogurt. I’ve tried these Lemon Blueberry Swirl Frozen Yogurt Bars with both the 0% M.F. and the 4% M.F Skyr yogurt. While I enjoy the 0% for yogurt bowls, I prefer the 4% in this dessert as it has cream added to it, which adds a creamier texture to the frozen yogurt and helps prevent it from getting too icy. These look phenomenal! I love the swirls! They would make a great dessert at a party! Thanks Christie! I love the swirls too! I made them for a BBQ gathering last summer and they were a big hit, so I’ll definitely be making them again this year!